So fine it'll blow your mind? Record anywhere with Blue's Mikey. 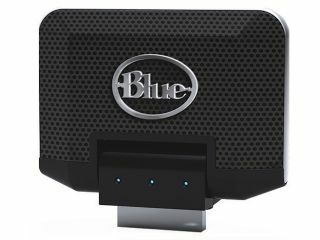 Blue Microphones' Mikey is a new plug-in stereo condenser microphone for Apple's iPod. Strangely, it doesn't worth with the iPhone or iPod touch, for which several recording applications are available (notably Sonoma Wire Works' new FourTrack), but owners of other models might find that it's a useful add-on for recording song ideas, gigs and practice sessions. Mikey has three user-selectable gain settings, while the inclusion of a speaker means that you can immediately hear your recordings without the need to plug in a set of headphones. The head can be positioned as required, and Blue says that Mikey will work with most protective iPod cases. Mikey is compatible with iPod 4G, 5G, 6G, iPod Nano 2G, 3G and iPod Classic. It should be available in December and will cost $80.